Thank you so much everyone for your patience during my break this week! I had a loss in my family recently so I was swamped with funeral and family matters. It’s just been a full week with lots of ups and downs and I just really needed some time to myself and my close ones. Thanks so much for holding tight during my absence! I want to give a BIG THANK YOU to my concept photographer and good friend, Christina who helped me guest post! It was definitely an informative food tour for New York’s Chinatown! Today, I’m back! Just in time for Halloween too! In my previous post earlier this month, I shared the essential make up to the perfect Halloween look. Today, I’m sharing the full look on how to turn a simple fashionable outfit into a witch look! This way, you can be a fashionable witch and turn the look from street style to Halloween costume! As I was doing the photoshoot for this, I got many stares from little girls walking by me and tugging at their parents, asking them to get my outfit as their costume! I couldn’t help but smile and feel accomplished, because this wasn’t so much of a costume than a street outfit dressed up as a costume! However, it was definitely fun to put together! And of course all the more satisfying when it got the green light as a successful and coveted “costume”. This so called “Halloween costume” was just put together by pieces I found in my closet. The only thing that really made this street style outfit a costume was merely adding a witch hat I bought for like $10 and my make up! What really stood out from my make up was of course the perfect purple lips. My eye make up is a light purple smokey eye that can easily transition from day to night. I used YSL’s Eye Duo Smoker Eyeshadow in Color 04 Burgundy for it. You can read more about my Halloween make up look here. Now let’s talk about the outfit! As you can see, my top is a black ruffle top with mesh on the side of my arms. It adds a bit more of a gothic feel for darker Halloween vibes. To add some color, texture, and dimension to this look – I opt. for a velvet burgundy skirt as the bottom piece. The wide waist belt also played a similar function to the whole outfit. I love the little weaved details! These little things are what makes the outfit fun and non-boring. I’ve actually never been a big fan of wearing dark colors only because I find it dull. However, through time, I’ve learn to appreciate the effort of dressing it up through added texture and dimension. Accessories is of course the finishing to the whole outfit – the icing on the cake. It’s so so important. For this look, I made the look all the more fun with my Samantha Vega x Sailor Moon bag. Those who know me know I’m a collector of Sailor Moon collectibles, so I’ve had this fun purse in my closet since forever! I just never thought of using it this way! When the whole “witch costume” idea came up. I couldn’t help but wish for a black kitty companion to complete the look! I have a black cat at home, but I can’t possibly get her to participate in my Halloween shenanigans – so this purse did wonders in helping my fulfilling the whole witch theme! My shoes in this case was also the perfect accessory to the entire outfit. Little fuzzy slippers are all the hype this season, since last seen on Rihanna. It’s a fashion statement item and adds texture and dimension – that’s a given. But as far as the witch theme goes, I see them as adding a little more depth to the witch like character. 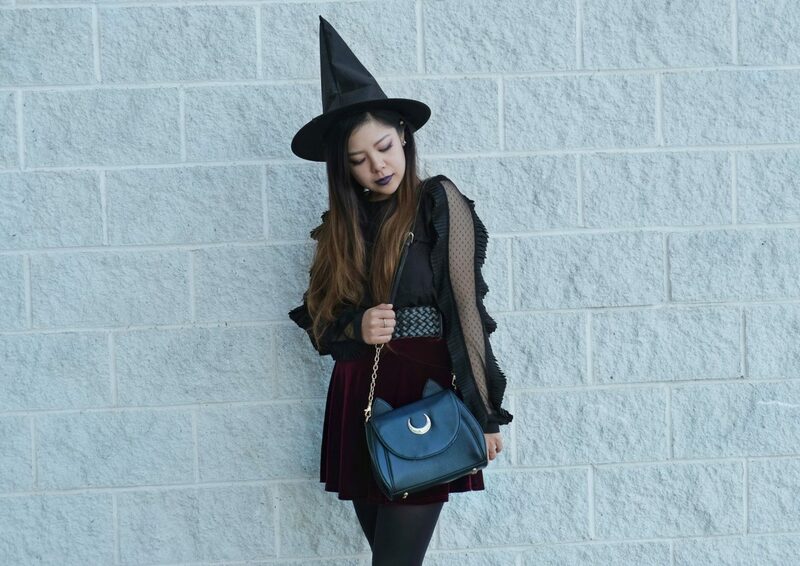 How did you like this Fashionable Witch Look for Halloween? Can you see it being styled from day to night? 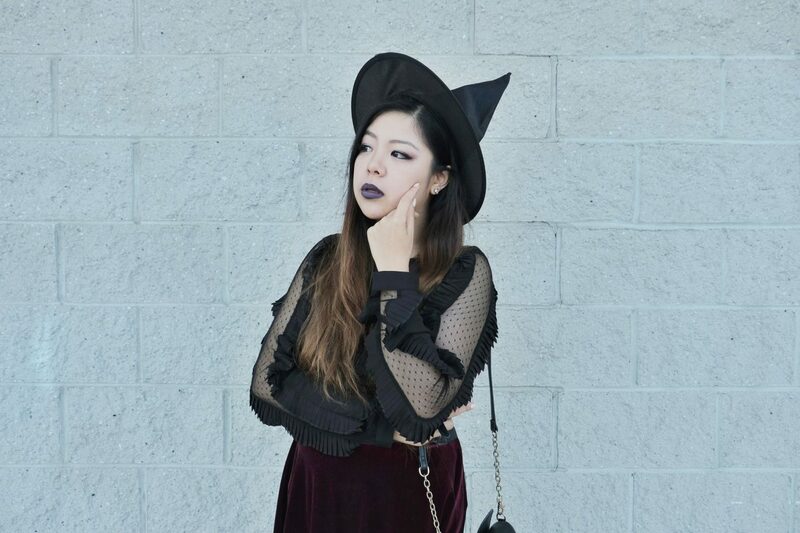 For me, I think this dark outfit is perfectly stylish for the day if you just subtract the witch hat and purple lipstick and switch to a brighter lipstick – like red or magenta. What do you think? Write back and let me know! I hope everyone has a fun Halloween! FTC: This is a non-sponsored blog post. This blog post contains affiliate links. Previous Post New York Chinatown Food Tour with a New Yorker! Your Lady Gaga costume sounds really cool! What a great costume! I’d wear something like this on Halloween. It looks comfy enough for me! I’m all about comfort. Yes, Amber! I agree. I prefer comfortable outfits all day! Your costume is fabulous! I love the subtleties but you also look 100% ready for halloween. It’s even better when you can dress up for very little too! Hi Louise! I agree. Best to recycle every little thing you have in your closet! Now that is one fashionable witch look! I love seeing all the different idea people come up for Halloween it is always so interesting. Hi Sarah! I agree! I love seeing what creative ideas people have for Halloween as well! I’m so sorry to hear about the loss in your family! This is SUCH a fun look though. 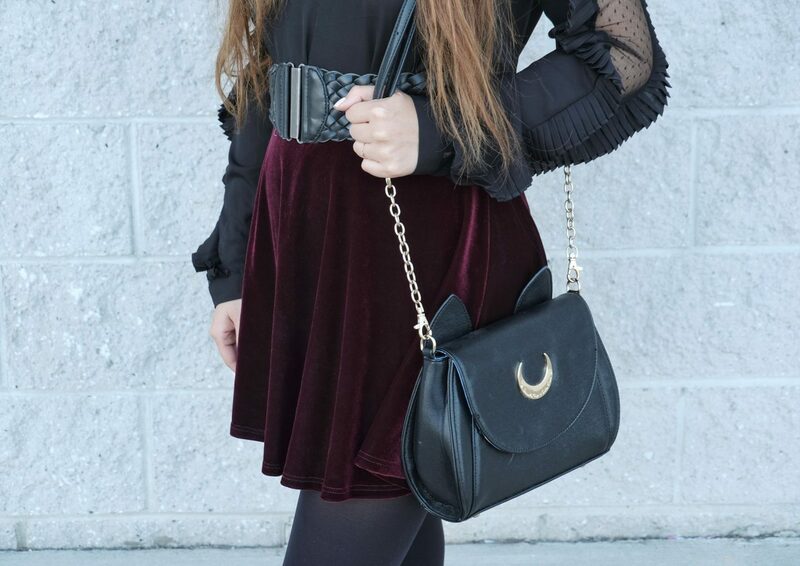 The bag is perfect and I really like the velvet skirt. Definitely a nice street style to costume outfit. Hi Lauren! Thank you for your condolences. I’m glad you’re enjoying the look! What a cute look! I’m obsessed with that fur on the shoes! It’s perfect! So sorry for you loss. I am glad you back to blogging. Such a cute costume, love your bag and blouse. Thank you Cynthia for your condolences. I’m glad I’m back as well! I’m so sorry for your loss. My wife would love your outfit and bag! I am so sorry to hear of your loss stay strong, if you need to talk just drop me a message ! On a positive note I love your fashionable witch look! Thanks Ana! That’s super sweet of you. I’ll keep that in mind! Thanks for the compliments as well! This is such a cute costume. I love the bag. I would use it all year long. I am being Little Red Riding Hood this year. Thanks Claudia! Yes. The Samantha Vega bag is super cute for collectors and very usable! I love your Little Red Riding Hood idea as well! Cheers to a Happy Halloween! This look is so cute babe! Happy Halloween! What a fashionable witch. The purse with the crescent moon was a cute touch. Ah this is really cute!! I love how you did your own twist! Great for last minute! You are one pretty witch I should say. A type of witch people would be taking pictures and not be scared of. I am trying this outfit in the next Halloween. Now that’s a trendy way to rock a fashionable witch look. The lip color looks so pretty on you. Perfect outfit for halloween! This is a great costume! Love it! Esp the purse 🙂 Happy Halloween. I love the transition to Halloween costume, using regular clothes you already had in your closet. As we grow up, it’s still fun to get dressed up, but it’s not that practical to spend lots of money on costumes – especially if they are only going to be worn once. What a great idea…I love it! Very cool and chic Halloween look! Very adult yet fun for a party or even to hit the mall – nice skirt. You look voracious yet awesome. Loved your costume. Thanks for sharing this look. You definitely pulled off that witch look really well! I didn’t dress up this year but this was a cute idea! Cool outfit! I think you pulled off the look pretty well. 🙂 I also like how you have long hair like a witch, that created the perfect look for you! Slay girl! Slay! I love the whole outfit and your sailor moon bag is my favorite part! I love love love this look! I love costumes that don’t look costume-y. It really shows creativity when people can create costumes out of the clothes they already have. That is a very creatively made outfit for the festival. The hat indeed adds flavor to the dress. I absolutely love this!! It turned out great! This is such a cute Halloween costume, thanks for the awesome idea, this time I’m gonna try to bring more fashion into my costume! the cutest witch for Halloween! I love the fact you are costumed and stylish in same time! good job! You really nailed it my dear! Such a nice outfit. Not over fashioned, still elegant looking witch for the Halloween! You’re totally slaying the look! I loved it! So sorry to hear about the loss in your family! This look is great, by the way! Love the dark colors, but that it’s not all black 🙂 Hopefully this week is better for you!